This game sounds amazing! I don’t know how I’ve never heard of it before. I’ve always loved ecology simulators, ever since I first saw a program running Convey’s Game of Life and figured out the significance of what it was showing. When I was a kid, we had this Windows 3.1 screen saver that showed a bunch of fish and sharks going by the screen, and their population would change over time. When they came on the screen, they would swim from left to right and chase each other. If the fish got away, next time they came back around to the left side of the screen there would be more fish. If the sharks didn’t eat, eventually they would go belly up and die. Generally the populations stayed stable but every once in a while it would go out of whack and you would see mass extinction events as the sharks overhunted the fish population and then died of starvation. My sister and I used to watch this when we were supposed to be doing homework, giving names to fish or sharks that we liked and rooting for them. When Spore came out I found myself wishing it was more like that screensaver and less like a game. I was actually working on making a really simple sim game about rabbits and plants in a garden using Flixel, but I eventually gave up because I couldn’t figure out how to give the player any meaningful interaction or goal in the system I had set up. man, that screensaver sounds awesome. When I was a kid I adored self-perpetuating systems like that– I would spend outs playing Odell Down Under, just watching the other fish live thier lives, trying to have as small an impact as possible. The thing about artificial life games is that we KNOW that the life they model is nothing like real-world life, but they’re almost more interesting and more powerful because of this. It lets us see, and understand, the way those systems work. That kind of understanding requires a phd in the real world, so when you can have that feeling as a kid from just watching a bunch of sprites dance around on a computer screen, it’s marvelous. I suppose it says something about me that I always went for the Great White and consumed without mercy. Yeah, I was getting serious Odell Down Under vibes from the description of that screensaver as well. I was personally a big fan of that self-playing, 3d maze from Windows 98. Totally agree that exploring and mastering systems in life sims (and all games, really) is all kinds of magical. Games are the only medium I know of which allow us to identify and internalize the rules of an entire universe, an experience I can never tire of. I’ve always wondered how this system would work in a game of a larger scale after I heard of GSC’s experiments with the A-Life NPC AI engine. Apparently, one of the game builds allowed for so much scope that an NPC could literally complete the main quest by themself, meaning that they could technically converse with other NPCs, add quest related tasks and explore on their own – trouble is, it was likely that the NPC would die pretty early on into their adventure. Now if GSC carried on with this A-Life engine operating the way it is, with a large number of logical refinements, then they would have created some really fascinating social game environments. what GSC is this? I’d love to hear more about this project. That would be the makers of Stalker. That game definitely does have an interesting living world to look at, with the factions attacking and defending each other and the animals running in packs out on the plains. They scaled it way back from some of the dynamic systems they were talking about, though. Granted, there are more than a few mods that amp up the A-Life system to a noticeable degree. I remember there were time-speed mods for this, to help with the feral runs. You could leave it running for an hour or two and a hundred generations would pass. All sorts of monstrosites could evolve, though you’d also need to mod them with quite a lot of in-built resistances, to avoid extinction. I have taken notice that in cermaas, specialized detectors help to maintain focus automatically. The actual sensors involving some camcorders change in in the area of contrast, while others work with a beam involving infra-red (IR) light, specially in low lumination. Higher specification cermaas from time to time use a mix of both programs and could have Face Priority AF where the dslr camera can See’ your face and concentrate only on that. Thank you for sharing your ideas on this website. We actually had Creatures. GF at the time didn’t like games, but found Creatures appealing. I think she played a few times, but it wasn’t a keeper. This is the sum total of my knowledge of the game. Surely there must be more games like Creatures out there by now? The Sims aside. If there are, I’m unfamiliar with them. A-Life games have fallen by the wayside in general, which is disappointing, but not exactly surprising. I don’t consider Spore an attempt, because it isn’t even trying, really. As to why they stopped where they did: doing Creatures in full 3D would probably have been incredibly difficult and expensive at the time, if they wanted to keep the kind of representational honesty that sidescrolling and sprites afforded them. The whole charm of the game was that it was developed by a small, small studio of incredibly bright people who had a lot of technical knowledge in A-Life specifically– I have no idea to what extent they had skills in 3D game design, etc. A full 3D system might have been beyond that team’s abilities. Coming out with just another sidescrolling, spritebased Creatures game would have been unimpressive unless they’d figured out how to make it dramatically more realistic in other ways. I think this is why the franchise took a nosedive into Creatures Village: it was hard for the games to actually get any more complex, so they went for kid appeal. It’s a shame that most specialist programmers don’t try to make more games using their talents. Of course, seeing how it turned out for the Creatures team is disheartening for hopefuls as it is. That would be what roguelike development is for, right? This post was brilliant and insightful. Laura Michet is a goddess among lesser mortals. I really enjoy these nostalgia-based articles with gritty overtones. Write about the insoluble moral conflicts in Amazon Trail II! I could write about that time you got your face paralyzed by jungle poisons and couldn’t finish the game, if that’s what you mean. 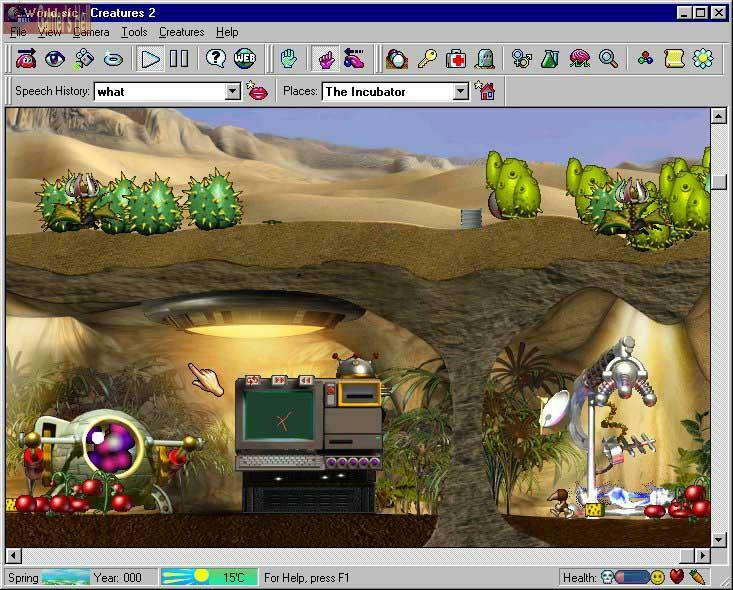 I played Creatures 2 when I was younger, for… a long time. I accomplished a fair bit in the game, but I was young and pretty stupid and didn’t uncover a lot of what was possible. However, I played it enough to encounter norn-related heartbreak. I had one norn, who was by far my favorite. She was adorable. I didn’t even let the guy norms near her. But she was… too curious for her own good. She walked into the sea, and drowned, while I was away from my computer for a moment. I only just had time to notice before she ran out of air and died. What was worse was that as her soul started up towards the sky as they did, it got caught in one of those stupid amoebas… and got stuck good. Her little stupid norn soul didn’t go to norn heaven; it was stuck, under the sea, forever. I shed a tear, for sure. I also had to scratch the save data because I couldn’t look at her poor little non-existent soul stuck in her watery grave. 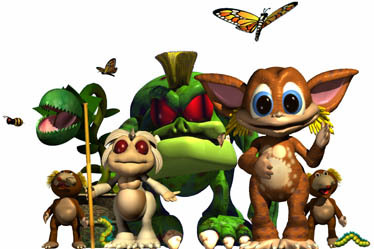 I tried picking up Creatures 2 again years later, as an adult, but couldn’t get back into it… the experience could never be the same after getting so attached to a specific non-existent entity (not unlike your Pokemon/Pocket Pikachu article, except that I still play Pokemon religiously). I’ve never played Creatures 3… but if it fixed a whack of the bugs from 2, perhaps I’ll give it a shot, if I can find a copy.
! I was going to say that you should totally check out Dwarf Fortress, as the feel I get from it is very similar to the feel you’re describing here. Well. Maybe it’s just the part where the being you indifferently control seems determined to off itself by doing something stupid while you frantically yell at the screen and try without effect to get them to help themselves. But I saw that you have written about it already and I am going to go read all that instead. >These days, life simulators are more popular than ever before—but The Sims has little in common with the back-breaking, soul-crushing, biology-wielding craziness that characterized the Creatures games. For one, you can’t do a feral run in The Sims 3. I recently obtained a copy of Sims 3 on discount and tried to do a feral run, because that’s what I’d wrongfully assumed had been going on in parts of Alice and Kev. I soon realized that The Sims 3 requires constant player input– it would just run until somebody had a phone call or an Opportunity, then pause itself. It’s full of modeled systems, but they’re not designed to run on their own. It’s just a game. Yes yes. Same with Spore — it LOOKS like Creatures but it actually isn’t that much like it. Oh gosh… I played creatures for years from one through to docking station and even adventures (which, while the minigames were fun, was really too cutesy…) Creatures 2 is by far my favorite since you can get very deeply into the genomes and chemical processes going on inside your norn. If creatures 3 also had such specific analytical tools (the medical bay was alright, but nowhere near as awesome as the science kit and neurology kit in c2) I would have loved the game more, even though it still charms me significantly. The horror, the frustration and eventual detachment from these creatures if amazing, eventually you become a bit of a mad scientist, experiemnting on them, cloning them or splicing them (a horrible process where both creatures being spiced are killed to create some new abomination, which quite often died). The community was also quite impressive, the vast amounts of knowledge and creativity in it… It’s a pity the development died and they;re trying to bring out some easy “pay for content/progress” webbased game of it now more like an app… Also the creatures seem to have more appearance based mutations than real chemical or other processes or genetic changes. I always tried to breed certain tempraments or high intelligence. I wish someone would build a new game with gameplay like this, but more modern additions and techniques. Oma means “Mother” in korean btw. Which makes it an eminently suitable name for that norn. And uh, blame rps for a post 4 years after this was published.